It's not easy commanding a starship hurtling through the infinite void of space. Life-and-death decisions weigh on you with every passing moment: Will you domesticate the warp weasels? Will you make a move on the transporter tech? Will you search for a cure for your tentacle-infested crew, or will you just "quarantine" them in the airlock? Hey, space is a dangerous place, and never more so than when you're on the Orion Trail. Orion Trail is a new project in development at Schell Games that recently went up on Kickstarter. Players take command of the Invincible II, the flagship of Galaxy Force, and lead it on a mission to explore the dangerous, eponymous Orion Trail. It's fair to say that it contains some echoes of FTL, but as the name strongly suggests, it really appears to be more akin to Oregon Trail, in space. So does the gameplay: You choose a ship, a captain and crew members, each with unique characteristics that impact how they will react in certain situations, and then head out on your journey, with a limited amount of fuel, food, and crew, and a specific task to accomplish. You'll be confronted by various oddball situations as you go, some deadly and some silly, and most with unpredictable outcomes: Attempting to capture an alien intruder results in your crew being sprayed with a noxious goo, for instance, but later on that goo causes them to spontaneously replicate, increasing your crew size, and your odds of making it to the end of the trail. 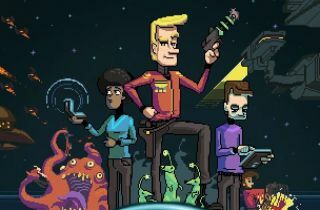 "Orion Trail’s gameplay centers around making the tough calls that only you, a starship captain, can make," the Kickstarter page states. "The galaxy is full of strange, stupid, and terrifying things, and you’ll need to make the decisions that ensure the survival of your crew. Well, most of your crew." There's a demo, downloadable or playable online, and I'm ashamed to say that I haven't yet made it to my goal. I have, however, managed to lose large portions of my crew to various mishaps, like the aforementioned airlock quarantine business, which was definitely not my finest hour. Incompetence notwithstanding, the demo actually ran quite well for me, although it notes that it's only a prototype and is "missing lots of cool features, and probably includes a bunch of bugs." Be that as it may, it looks really promising, and it's nice to actually have something to play when you're considering a new Kickstarter. Schell Games is trying to raise $90,000 for this one, which runs until March 12.